Question: Just how much horsepower does a stock, US-smogged/carburetted Triumph TR6 produce? Good question, I asked. Non-US TR6s received the Lucas mecahnical fuel injection system which, in the 1969-1970 models, was reputed to develop 150hp. The 1974 US-spec TR6 was quoted at 104hp. Direct comparisons are not really possible, because the methodology of quoting horsepower changed over the years. Through to the late 1960s, engines were placed on a engine dyno, and stripped of all auxillary items such as alternator, flywheel, water pump (cooling was provided by an independant pump), dry-sump lubrication, fan-forced cool air to the carburettor, no cooling fan, no air-cleaner, leaner jetting, and highly advanced timing, etc. By the early 70's, manufacturers were not allowed to be as liberal in estimating, but still the motors on the engine-dyno were not the same beasts as would be pushing around Mum's station-wagon. The best measure of true horsepower and torque is to measure it at the rear wheels. This way a real-world estimate can be obtained. My own TR6 is fairly stock; the engine has never been out of the car or worked on. It is a tired old donk with 80,000+ miles, so substantially less than the factory figures were to be expected. However, I have made some very simple and inexpensive modifications which I believe really helped; namely, K&N air filters, easy-breathing exhaust, Pertonix electronic ignition, electric cooling fan (ie, no mechanical fan), removal of all smog equipment, and carbs rebuilt and tuned by me. 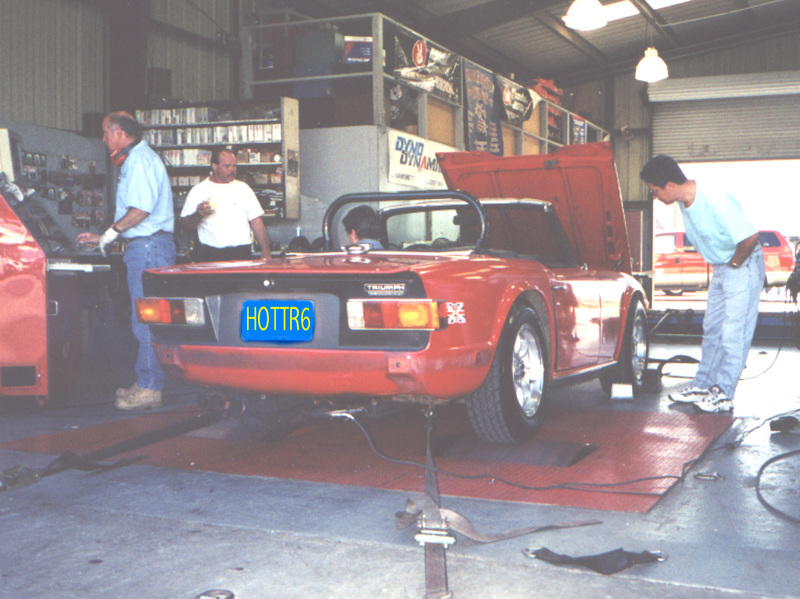 The work was carried out by the helpful guys at the Dyno Shop in Santee, California (619/562-3933). Air temperature was 74F. I had the car tested at the same time as my Mates in the Pantera Club, and their big worked 351 Clevelands were pulling 300-450 rwhp (rear-wheel horsepower). Their runs on the chassis-dyno took only seconds. 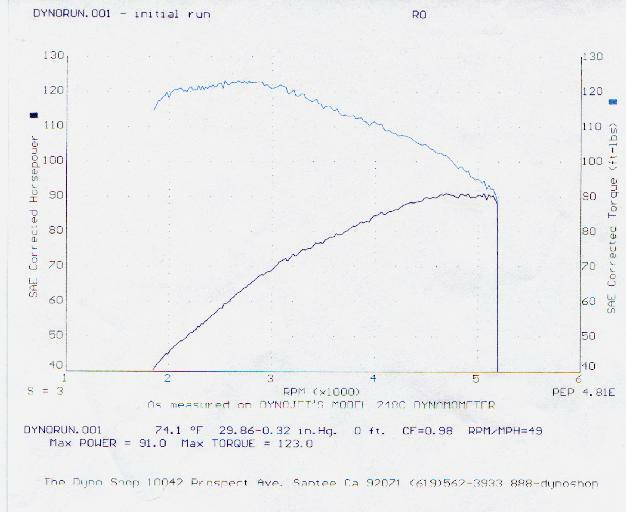 When time came to dyno the TR6, the run seemed to take forever, but everyone remarked at what a gorgeous exhaust note the 6 had. Some fellows likened it to an older V12 Ferrari, or maybe half a Ferrari! The results of 91 rwhp at 5,000rpm and 123ft-lbs at 2850rpm are pretty impressive for an essentially stock and tired motor. What does this equate to in the real world? At the drag strip, my TR6 will dispatch equally tired Datsun 240Zs and early Mazda Miatas. I'm happy with that.